Hi! Greeting from Segamat! Today I am going to introduce you something good! First, Look at the picture below! The left side is without any make up on while the right side is with makeup on! It is such a great difference right? Continue reading to find out what products I used. 3CE is a brand originated from Korea and it sell various makeup products ranging from eyes, nose, lips, face and even nails! The packaging of the cream blusher. The 3CE cream blusher comes in a tube form. Just squeeze a little bit out from the tube and apply it onto your face or you can directly squeeze onto the face and blend it. The color after spreading looks as below.. This is what happen when I applied it onto my face. Just smile and apply it on your cheeks. 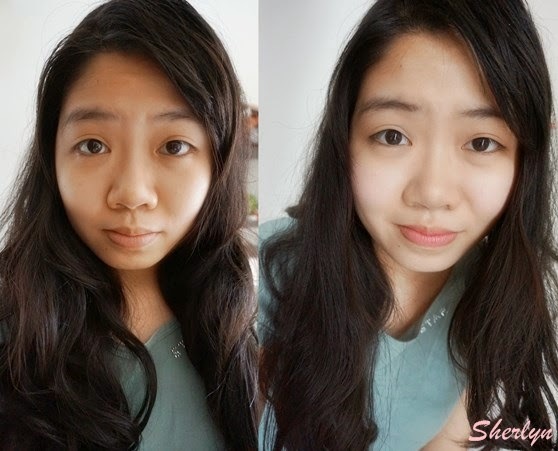 As you can see, it is a very natural pink and it give my face some pinkish color. This is exactly what i love since I opt for natural makeup most of the time! Their shimmer stick comes with 2 colors, peach and pink. For the Peach, it comes with light peach color with gold glitters which give you a luxurious and natural glow. It is damn good and natural stick highligher, easy to use. Just glide through your T-zone area and cheek bone and you are done! I really love this stick as it is so natural and amazingly natural. It is like THE BEST! Lip lacquer creates powder-like soft cashmere lips. It is non-sticky and give you a soft finish looking. There are 2 ways to apply it. One is fully filled with the lips with the color or create a gradient lips. But.. I am a bit special, I am not used to fully colored lips so I use my lip brush to take a bit of color and apply it on the center of the lips and blend to the whole lips. Even though it is kind of fully colored this way but I like it this way as the color is more natural and lighter. My way of applying showtime lip lacquer makes my lips color natural but at the same time defeat the purpose of me taking photos trying to show you guys the color on my lips! But no worries, you can have a close look at the color here. The picture below shows 3 of my favourite products from 3CE. Have a look on my hand, the most left side showed you the shimmer stick color on my hand, while the middle one is lip lacquer color and the right side is the new pink cream blusher! Wondering where you can get all the products mentioned? you can get it from SkinCandy.co. All their products are directly imported from Korea! Anothing thing, after you received your items from Skincandy.co and post the received items on social platform by tagging @skincandyco & hashtag #skincandyco , you are entitle another RM 5 off for the next purchase. Lastly, SkinCandy.co will be launching the “1k fans giveaway”. Once achieve 1k fans, SkinCandy.co will hold a giveaway as an appreciation to the followers. So actively share skincandy.co fans page and spread the word! Below are some testimonials given by the customers to Skincandy.co! I hope you have a great time reading it! Again, heads to one of the social platform below to choose your preferable items! And don’t forget to use the code “SHERLYNXSC5” when you make any purchase for RM5 off. Have a great time and love.